The last time that Syracuse was ranked No. 1 in the country, it was 2012 and they were undefeated. Their first game as the No. 1 team in the country that season---a loss to Notre Dame. Irish at Syracuse at 7 PM tonight on ESPN. Texas A&Mhas gone two in a row without a player scoring in double figures. Yikes! Four of the Top-10 lost on Saturday…Arizona (with 0.9 seconds remaining), Oklahoma State, Michigan State and Kansas…Gadzooks! Then on Sunday, Michigan loses as well. Baylor won over Oklahoma State without starting point guard, Kenny Chery. Baylor is home vs. Kansas on Tuesday. Andrew Wiggins fouled out with just seven point and five boards. SMU is unbeaten at home. Xavier is 2-3 in last five. LSU is 4-1 in last five…by an average margin of 12 points. 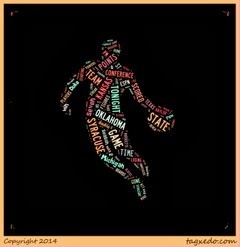 Oklahoma State is 1-3 in fast four. Georgetown’s victory over Michigan State stopped a five-game losing streak. Someone had to win the Ohio State/Wisconsin game. Both are now 17-5 and 4-5 in conference. 1-4 for FSU in last five. 18 in a row for San Diego State. Marquette might not even make the NIT. St. John’s Chris Obekpa had seven blocks against Marquette. Kansas State looking like an NIT team. UMass has lost three straight road games…three of last four overall. Charleston Southern’s Sheldon Strickland hit seven three-pointers. Syracuse got just four points and six boards from their bench…Duke bagged 30 and seven. 71 bench minutes for Duke…28 for Syracuse. Syracuse scored on all but one possession in OT. Nine blocks for Syracuse…zero for Duke. Just 16 turnovers between the two teams…eight a piece. Both teams made 31 baskets. It’s possible these two could meet three more times this season. Just a junior, VCU’s Briante Weber is now the all time leader in steals at the school. It has been 54 years since Northwestern last pulled off a three-game winning streak on the road. Texas just a game out of first place in the Big 12. Three straight opponents have shot better than 40% vs. Kansas. Davidson is still the team to beat in the SOCON…8-1 in conference play. Virginia’s Malcolm Brogdon’s 3-pointer at the buzzer at Pitt put UVA at 8-1 in conference. Brogdon has scored in double figures in all nine ACC games. With their favorable schedule coming up, UVA could wind up 15-1 on March 1st. Tyler Harvey of Eastern Washington knocked in ten threes in an OT win over Northern Colorado. Since dismissing three players, including their leading scorer, UTEP has gone 6-1. Grambling hasn’t beaten a Division I team since March of 2012. Mississippi Valley State tonight. Not so fast: Five seniors start for the 20-2 St. Louis Billikens. One more thing: Why is the coach’s box rule never enforced? Congratulations!!! You made it to the end. Celebrate by watching some college hoops tonight. Iowa State @ Oklahoma State---9 PM on ESPN, tonight under the lights.